Your superstars packed their lunch box and came to play. Speaking of Tiger Woods and Phil Mickelson, the pairing put the clamps on the field Sunday afternoon. Both players had better scores on Day 4 than any of the final three remaining in the playoff for the famed green jacket. Phil pops off a score of 30 on the front nine at Augusta, improving his overall score from -4 under at the start of the day to -10 under. He birdie's six of the first nine holes and inches closer and closer to the lead. Tiger Woods, while his putting left something to be desired, had to double-bogey his way out of the tournament on holes 17 & 18. Before that, Tiger was Tiger. Two birdies and an eagle leading up to the final holes put Woods in play and pressure on the leader board. The roars of the crowd followed Phil and Tiger all day long while the pairings behind them were attempting to hold onto their lead heading into Day 4. The most glaring statistic was that at one point in the final day, Tiger and Phil were well under par and the field was sitting at +6. Even though Tiger and Phil finished outside of the top three, the fact that they made it as exciting as they did, shows you how good they are. Yea, they stole today from the leaders, and while missing huge shots in the final holes, both Lefty and Tiger put on a show for the fans at Augusta, and the many watching at home. A Master's rookie, shouldn't go unnoticed. While we were busy following the game's best around the fairways and greens, an American in his first time at Augusta, tore up the course shooting a day's best 66. That would be one John Merrick. Merrick had three birdies on the front nine and through holes 13, 14, 15, and 16, Merrick birdied four consecutive holes. John Merrick finished the tournament tied for sixth, with the likes of Tiger Woods, Steve Flesch, and Steve Stricker, who have a combined 26 years of Master's experience. No other first year player in the '09 Master's, finished better than twentieth. After back to back days of 70+ scores, and sitting nine off the lead, Merrick made the biggest charge on Sunday and we can take this as his assertion in Augusta. I don't know much about golf, but in the past year Merrick has finished sixth at Augusta and also finished sixth at Torrey Pines in the '08 U.S. Open, I'd say this guy is going to make the jump very soon. Tee off shot lands in the woods, and you get a green jacket. The winner, Angel Cabrera, puts his ball right in the woods off the tee in the first hole playoff. Tiger did this an hour or more earlier, and bogied the hole playing his way out of the tournament. Not Angel, oh no. Cabrera drills the ball into the woods, pounds his second shot off a tree and puts the ball in perfect position to get it up on the green. Destiny. When Cabrera won this tournament the first thing which comes to mind is that shot, he puts it straight off a tree, you think he's gone, and then before you know it he's pulling on a green jacket. Cabrera spends the first three days of this tournament under 70, and on the final day he does everything but throw the tournament in the trash. Cabrera has to birdie three of the last four holes and needs his pairing mate to bogey the final two holes to even get a shot in a playoff. Anyone who says that Angel Cabrera wasn't meant to win this tournament, is flat out crazy. A rough and tumble final day, balls into the woods, three bogey's in the first ten holes, and Angel Cabrera still wins the 2009 Master's Tournament. NO golf tournament is complete without a collapse. Thank you, Kenny Perry. Before I get into his collapse on 17 & 18, when the jacket was all but on him, both Tiger Woods and Phil Mickelson bogied 18, and Tiger even bogied 17. Kenny Perry winning would have been exciting, oldest to ever win a jacket, Tiger and Phil having failed on the final holes, it was his to win. Then he lost it. By the time the playoff rolled around, and Perry had just lost the tournament by putting up bogies on the final two holes, he was spent. Every shot in the final two playoff holes looked forced and tiring. Perry managed to play it safe all morning and keep the lead, 11-straight pars. 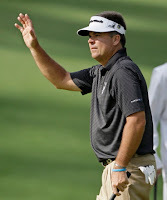 His pairing mate, Cabrera, and other opponent in the playoff, Chad Campbell, had already bogied five holes combined before Perry even birdied a hole. Tiger and Phil missing crucial putts, what else could have gone right for the 48-year old Perry. Then, he collapses, and bad. Shoots his only bogies of the day on his final holes and that's all she wrote. He struggled in the playoff and it was only a matter of time before Cabrera made a great shot. I'd be pretty bummed if I was Perry, because he couldn't have had it better. That is probably the only column your going to get from me about golf, but after watching the final day of play at Augusta, I couldn't avoid it. Thank you for reading as always. BTW, the past tense of "Bogey" is spelled "Bogeyed," not "Bogied"